Seaventures, Inc. is a certified Disabled Veteran Business Enterprise (DVBE), based in Dana Point, California, and is owned and operated by Bob Lohrman and Ken Nielsen, both of whom are U.S. Coast Guard Licensed Masters (100-ton certification). They have a combined 90 years of experience in the commercial and sport fishing industry, with over 30 years conducting scientific research, environmental monitoring, and collection projects. 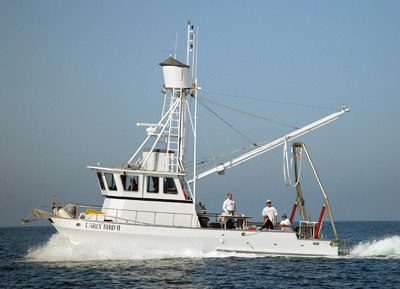 They have successfully participated in thousands of projects throughout the southern California Bight, including previous SCCWRP Regional Surveys; Montrose Settlement Restoration Project for NOAA; numerous surveys for the Ports of Los Angeles, Long Beach and San Diego; and many other programs. 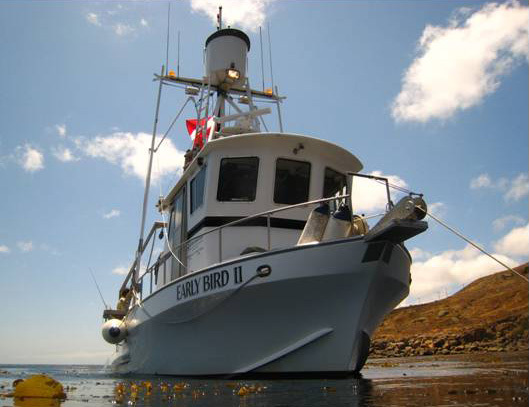 They own and operate the 42-foot research vessel (R/V) Early Bird II. The vessel is U.S. Coast Guard-inspected and equipped with two differential GPS’s with plotters, 2 kW color fathometer, radar, side-scan sonar, two VHF radios, two-meter radio, 21 kW three-phase generator, twelve-man life raft, GPS emergency positioning beacon, bunking space for up to six persons, and a thirty foot tower (crows nest) with helm controls. The large rear deck supports a 13-foot hydraulic A-frame (1-ton capacity); a deck winch with 5000-ft of cable; a large boom and boom winch; three, 50-gallon bait tanks with two-inch water source capable of supplying additional tanks; and a swim step and dive ladder along the stern. Most of these items can be easily removed or added, or the deck customized to meet the needs of any project. In addition, Seaventures owns a thirty-foot bow plank for tagging marine mammals, etc. Other smaller vessels owned by Seaventures and available include: 17 foot Boston Whaler with 90 horsepower Honda four cycle engine, 14 foot Carolina Skiff with 15 horsepower Yamaha outboard, and a 12 foot skiff with 15 horsepower Yamaha outboard. Seaventures wide breadth of services includes both vessel support and specialized skills and experience for just about any type of marine survey effort, with the primary goal of providing a suitable platform for conducting marine-related efforts and to offer technical expertise and solutions to potentially challenging situations. A brief list of the services offered by Seaventures include sediment collection using a variety of different methods (e.g., vibrocore, gravity core, piston core, box core, van Veen grab), biological sample collection (e.g., bongo and plankton nets, otter trawl, lampara net, purse seine, gill net), efforts using ROV/submersibles, multibeam/side-scan/magnotometer/sub-bottom profilers, water quality sampling equipment (e.g., rosettes, CTDs, van dorn, niskin bottles), diving operations, and mooring/buoy deployment and maintenance. Seaventures also has a large storage area, and owns a variety of sampling equipment, with specifications available upon request. Seaventures is fully licensed and insured with personnel OSHA-certified and hazardous waste worker trained. Their knowledge of the southern California waters and experience makes them a valuable asset to any project team. Both Ken and Bob are certified Los Angeles County SCUBA divers since 1963. Ken is a certified OSHA 40-hr HAZWOPPER and Site Safety Supervisor.